Retro like an afro, but totally out-of-this-world modern at the same time! This stunning Diesel bag is one you'll be dying to show off. 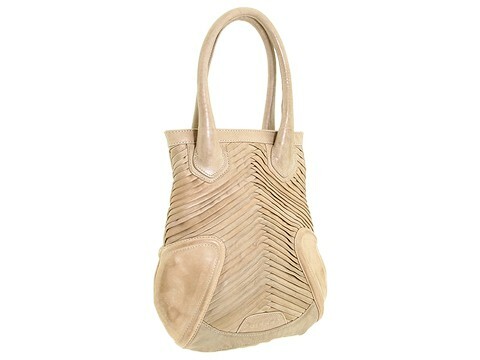 Glazed leather in a stunning chevron pleating design. Dimensions: 11 wide x 13 deep x 15 high. Dual shoulder straps. Shoulder drop: 7 length. Top tabs with snap closure. Back wall zip pocket. 25.00 oz. Welcome to Moda Italiana, where made in Italy fashion-leaders and trends-setters creations are at the lowest possible prices. Moda Italiana literally means Italian Fashion, and this is exactly what we offer you: the most exclusive fashions and the most luxurious accessories that will finally make you feel (and look) good in your clothes. The key to a glamorous look is to get a few selected high-quality items that will soon become the core pieces of your wardrobe. Whether you want to follow and lead the latest trends and be a little bit extravagant, or you want to achieve a timeless, sophisticated look, this is the place to turn to. ModaItaliana.it :: Italian Designers, exclusive fashions, outlet prices. Looking for authentic Italian charms? Pugster is your online source for Italian charms and fashion jewelry! Pugster carries thousands of Italian Charm styles, including create your own custom and laser charms. We also have a huge selection of fashion jewelry, with collections include sterling silver, mother of pearl and murano glass. At Pugster, you can always find something to fit both your style and your budget! Click here to begin shopping today. Coupons Choice - Extra Choice! Get our free news on your blog! Get the ModaItaliana.it widget and many other great free widgets at Widgetbox!